Although it is our intention to operate the itinerary as detailed below, it may be necessary to make some changes as a result of climatic conditions, alterations to flight schedules or other operational factors. Arrival in Kathmandu. You will be met from your flight and transferred to the joining hotel. This evening we will make our introductions and have a group chat followed by a meal together. After breakfast there will be a tour of the main sights in Kathmandu: Monkey Temple, Durbar Square and Kumari Bahal. In the afternoon you will be free to explore this charming city. Our cycling begins with a ride to Kakani. Most of the towns around Kathmandu sit at the bottom of the valley – Kakani at the northern edge is set above a ridge. Just off the road to Trisuli Bazaar there are magnificent views stretching from Annapurna to Everest, via Manaslu, Ganesh Himal, Gauri Shankar, Dorje Lekpa and Shishapangma. There was some earthquake damage here in 2015 but the village is open for business as usual. We follow well surfaced road for 6km towards the Shivapur conservation area then continue for around 5km on jeep track, which brings us to a typical local village Sawana Gaon. From here we cycle on with a gentle downhill to Chilaune and then climb for 5km to join main road to Nuwakot. We cycle for 13km on paved road with a gentle climb until the last 3km; a steep climb to reach Kakani. We will get have awe-inspiring views of majestic Annapurna Mountain, Dhaulagiri Mountain, Ganesh Mountain and other mountains. Kakani is famous for its colourful strawberry farm and Japanese rainbow trout. After breakfast at around 9am we cycle back to Kathmandu, via a different route. The ride begins with a 3km climb to reach the Sivapuri conservation entrance gate. Once our permits are issued we cycle on into jungle. 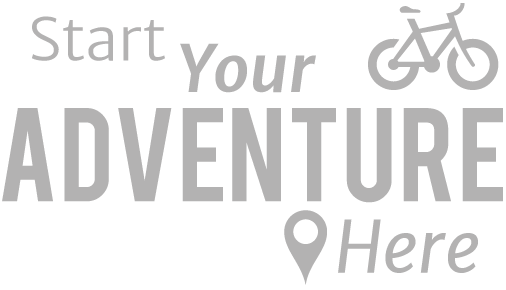 Afeter cycling for around 45min we will have beautiful views of the Kathmandu valley. We continue through a country side of rice fields and a few villages. After 3hrs of cycling we reach Kathmandu. There is time this afternoon to see more of the city and get ready to travel on to Lhasa tomorrow. This morning we fly to Lhasa. On arrival you will be met by our local Tibetan guide. You will be presented with a Hada (a white scarf which is a symbol of good luck and happiness in Tibetan culture). The drive to our hotel takes about two hours. Later this afternoon you have time to explore the local area and acclimatise to this high altitude city. A free day with the option to go to the Sera monastery. One of Tibet's 'great three' university monasteries, the Sera was built in 1419 during the Ming Dynasty. It was named Sera, meaning rose, because the hill behind it was covered in wild roses in bloom when it was undergoing construction. This afternoon we see Lhasa's principal landmark: The Potala Palace, a structure of immense proportions. First built in 641, since them it has been expanded many times. Nothing can compare to your first sight of this 'wonder of the world'. In the morning you have the option to visit the Jokhang Temple, the spiritual centre of Tibet. Pilgrims from all over Tibet trek here to worship. To Tibetans the Jokhang is the most important and most sacred temple in Tibet. Along with the Potala Palace it is part of a UNESCO world heritage site and a popular tourist destination in Lhasa. This afternoon we can build our bikes in preparation for tomorrow. We leave our hotel in convoy out of Lhasa, stopping outside the Potala Palace for a group photograph to mark the start our epic journey. Once outside Lhasa you can take advantage of the flat roads and go at your own pace, with the opportunity to stretch your legs and get warmed up for the climbs to come! The route follows the deep green water of the Kyi Chu (Lhasa River), with hills forming a picturesque backdrop as we head towards Chusul. The road pulls away from the river as we pass the recently constructed bridge and tunnel to Lhasa airport and gain our first views of snow-capped mountains ahead. We stop for some lunch and then it's on towards Daga where we cross onto the south bank of the Yarlung Tsangpo River; the highest major river in the world, with an average elevation of about 4000 meters. The route continues on the south bank some 10 km to our camp at the base of the Khamba La pass. We have a short walk to the river to freshen up before dinner is served by our Nepalese cooks. Today marks the first of our major climbs - 23 km to the Khamba La pass at 4,807m. The climb is eased by recent tarmac surfacing of the road, but it will still be a tough day's cycling as our bodies continue to adapt to the high altitudes. 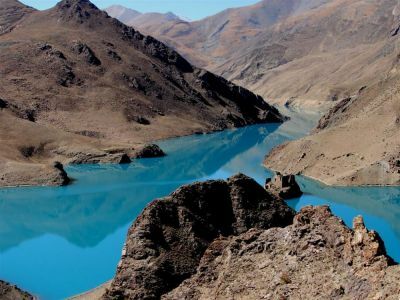 You will be rewarded for your exertions on this morning's challenging climb with the sight of the stunning, turquoise waters of the Yamdrok Tso (lake), this is a sacred lake to Buddhists. You will also be treated to views of the snow-capped Nazin Kang Sa (7,252m) in the distance. We now make a fast descent (500 m) to the lake below and onto the Tibetan plateau. We will stop for lunch after about 5km. This afternoon we complete the last 38 km into camp along flat but tough terrain. As we leave our camp today on the tarmac road we head west and climb to cross the Karo La (5032m). The first of the passes above 5000m, this is a challenging but enjoyable ride to the top of the pass, from where you will see an imposing glacier. Karo La is where Francis Younghusband fought a battle with Tibetans in 1903 to reach Lhasa. Today begins with a gentle climb of 15km to the top of the Simi La followed by an easy ride of 35km, mostly downhill to Gyantse. The town is home to some magnificent military and religious sights dating back to the 15th C. The most famous of its monasteries is the Kumbum, a gold-topped pyramid barely touched by the passage of time and one of the most spectacular buildings in Tibet. You will be free this afternoon to enjoy looking around Gyantse. A comfortable ride on a nice tarmac road to Shigatse. As we follow the Nyang Chu River, we turn one corner after another along a series of bends in the road. Unusually for this trip we are on flat road all day. Today is a rest day, with the option of a tour of the Tashi Lhunpo monastery led by our Tibetan guide. The Tashi Lhunpo Monastery is seat to the Panchen Lama, the second most important spiritual leader of Tibet and was founded by the 1st Dalai Lama in 1447. It is one of the four great monasteries of Central Tibet and was supervised and looked after by the Dalai Lamas and Panchen Lamas of the Gelugpa, or Yellow Hat tradition. We leave Shigatse in convoy, climbing steadily up 125m in the first 8km at the start of a long day's cycling. After some 35 km we cross the barely discernable Tso La pass (4050m). The undulating terrain takes us through a landscape of fields where children will shout "Hello!" and run to greet you if you stop to take a break. The surrounding mountains close in on us as we enter into a river valley before reaching our camp a short distance before the Tso La pass. 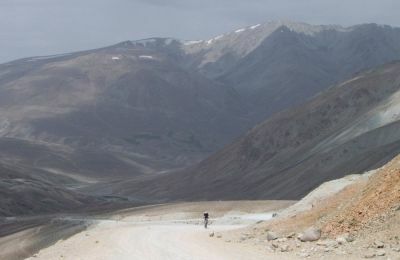 A steady 8km climb takes us to the Tso La pass (4,580m), followed by a fast downhill descent of 425m over 29 km, and a flat stretch into Lhatse. Lhatse is reminiscent of a Wild West frontier town; children here are both friendly and inquisitive and not afraid to interact with us strangely dressed cyclists! We head out of Lhatse and into the Chusar Chu valley, where we camp at a very picturesque spot along the riverside. The day starts with a 24km climb on sealed roads to the highest pass - the Gyatso La (5,253m). You will be rewarded with stunning views of the snow-capped mountains either side of the pass and the offer of a cup of Yak tea from the solitary tent alongside the fluttering prayer flags. We drop down 10km, out of the wind, to our lunch stop. The gradual descent takes through small villages and past Stupas down to the Lolo River. You may well be greeted by excited children from a roadside school at the foot of the descent, before you reach camp at a picturesque site next to the river. A fast descent from camp takes us through a checkpoint and to the turn-off for the highlight of the tour: Everest! The early morning sun softens the rugged appearance of the landscape bathing the snow-dusted mountains around us in light. The terrain changes abruptly as we leave the main road towards Everest and the switchback-climb to the top of the Pang La (5205m) is slow going. On a clear day you will enjoy stunning views of the Himalayas at the top of the pass, with Everest directly in front of you. Another fast descent of endless hairpin bends takes us through settlements where local people group together in the fields drinking Yak tea and making bricks. We drop further onto an almost desert-like valley floor surrounded by rugged mountains cycling on to our campsite for the night. We climb gradually through villages where children rush to greet us, eager for any photo opportunity. They may even be keen to take a test-ride on your bike! Jagged snow-capped peaks confront us as we start our climb to Rongbuk. Your anticipation will increase at the turn of every corner as prospect of seeing Everest draws ever closer. Just beyond the monastery at Rongbuk, the awe-inspiring backdrop of Everest is a just reward for the challenges of the last few days. We have a steady 8km ride taking us to the base of the North Face, a truly spiritual experience - simply unforgettable! We return to our campsite just before Rongbuk to our campsite for the night. This morning we cycle back down the valley, retracing our tracks from the previous day. For the more technically minded riders there are some excellent sections of stone single track, with Everest in the background! We continue with a superb off-road ride on smooth mountain tracks, interspersed with some very rocky rough sections that will provide a challenge even to our hardy support vehicles. We cross the Lama La Pass, at 5101m before descending on a mixture of rough sections of road, mixed with free-flowing dirt tracks and stream crossings on into the barren plains ahead of Tingri. Here we rejoin the Friendship Highway cycling to our camp just outside the town. Today's cycling is predominantly flat, although headwinds may hamper an otherwise comfortable day! The ride will take us through a landscape of monasteries, fortresses and clear mountain rivers. We begin the day with a steep 155m climb up over the Lalung La Pass, heading west for the rest of the day on undulating terrain all the way to our camp at the beautiful Paiku Tso Lake. 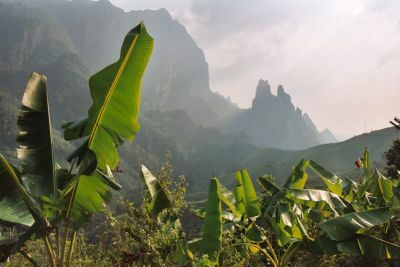 Surrounded by towering mountains on three sides, numerous small streams drain into the lake. There are wild birds and horses in the surrounding area. This area is one of Tibet’s magical spots with stunning views of the snowcapped Shiishapangma(8,012m) the only 8,000m peak situated wholly with Tibet and the Langtang range bordering Nepal to the south. Heading away from the lake, today is the biggest challenge of the tour so far! We cycle 2 monster passes the first at 5,000m, the second 5,253m. The rest of the cycling is downhill to reach Gyirong. This region of Tibet is known as the back garden of the Himalayas. Today's route begins with 42km on undulating road; we then drop over 200m for the next 50km as we follow the Girong Zangbo river, to reach Mangmu. We continue on for 8km to the border to cross the Friendship bridge bidding Tibet farewell. The border point between the two countries sits in a valley of approximately 300m. On the Nepalese side is the Rasuwa Fort, the site of a three-day battle during the second campaign of Sino-Nepalese War in 1792. The fort was constructed on the site in 1855 when Nepal invaded Qing-ruled Tibet in the Nepalese-Tibetan War. We stay tonight at Rasuwa Ghadhi. From Rasuwa Garhi we we cycle the Pasang Lhamu Highway alongside the along the Trishuli River beginning on narrow road bordering the Langtang National Park. We enjoy a scenery of waterfalls, river, gorges and forest; small houses cling to the steep mountain sides. We begin our ride with a pleasant 14km gentle descent to the foot of Syapru Besi village a popular start point for people trekking in the Langtang valley. From here we climb on winding road to Dhunche village 2/3 of the way up where we stop for lunch. Look out for views through the clouds of Langtang Lirung peak (7246m). Today begins with a steep descent of just under 1,000m over a distance of 15km. We continue to follow the Trishuli river downhill for a further 17 km before challenging a final monster climb of over 1,000m 34km, then its downhill for the final 22km into Kathmandu. Tonight, we will gather together to celebrate the end of our epic journey. In the evening we get together for that all important and well-deserved celebratory meal! The tour officially ends this morning. Hotel check out time is midday. We will arrange a free transfer from the hotel to the airport for your international flight home. 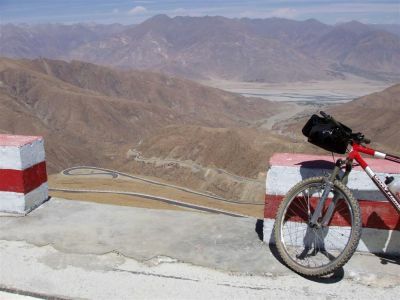 "My second trip with redspokes and my second time riding the Lhasa to Kathmandu route. Had a fantastic time, made some great friends and rode this truly spectacular route. Thanks to..."